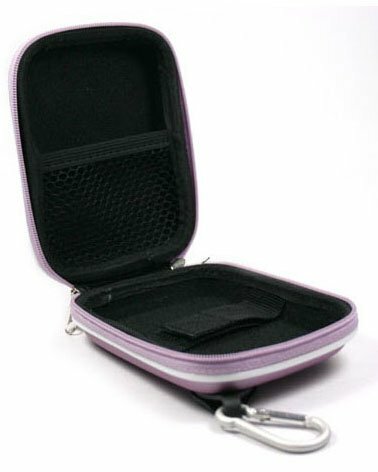 Safely carry your camera with this Digital Camera Case design for small and medium size digital cameras. Padded shell case protects your camera from bumps, shock and scratches. Dual zipper opening allows easy access to camera. Velcro strap holds camera in place inside the case and prevents camera from falling when you open the case. Inside pocket holds additional memory cards. Comes with a carabiner so case can be clipped to your belt loop, travel bag or backpack. Regular and Slim Version Available. Regular Eva and Nlyon Case Approximate interior dimensions: 4.13 x 3.13 x 1.3 inches. Slim Eva case inner dimension: 4x2.5x0.9 inches. Not what I ordered ! Really like the way this case attaches to a belt loop. My husband loves it! Like that it is a hard case in case it gets dropped. Screen saver was difficult to get on. Love this case!! It's perfect! This case is very slim, but it lets me keep all the extra storage and my camera together.